Importance. -- This borer is found in the East wherever its host species grow. Young trees 2 to 8 inches (5 to 20 cm) in diameter, in the white oak group are attacked. Some degrade occurs. Identifying the Insect (figure 22a). -- The larva is moderately robust and cylindrical; 1 to 1.5 inches (25 to 37 mm) long; yellowish white; head strongly depressed with dark brown mandibles; and legless. The adult beetle has a spine on each side of the thorax; about .8 to 1 inch (20 to 28 mm) long; white and brown mottled; and antennae about as long as the body. Identifying the Injury (figure 22b). -- Egg niches .25 inch (6 mm) in diameter cut singly in the bark are followed by oozing sap and teh extrusion of fine, moist frass. Later, the insects eject yellowish, ribbon-like pieces of frass containing pulverized or fibrous, shredded wood. Galleries are about .5 inch (12 mm) in diameter and 6 inches (15 cm) long. Each borer leaves a small, elongate entrance hole and a circular .3 inch (8 mm) exit hole. Biology. -- Adult beetles emerge during May to June and deposit eggs. 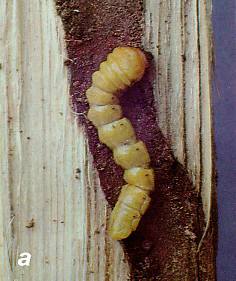 Eggs hatch in about 3 weeks and the larvae tunnel directly into the wood. Pupation occurs within the gallery and lasts 2 to 3 weeks. A life cycle requires 3 to 5 years. Control. -- Woodpeckers and sap-ooze are the most important natural controls. Remove brood trees. Follow practices that promote stand vigor. Direct controls are occasionally needed. Figure 22. -- (a) White oak borer larva in gallery; (b) brood-tree of white oak borer with numerous attacks and frass around the base of the tree.